At last week’s design team meeting, we made a decision about the direction of the overall theme for Fedora 14’s artwork, which will affect – among other things – the default wallpaper. We decided on Kyle Baker’s submission, a Blender-created mockup depicting many lines coming together to form a solid figure, to serve as the basis of the visual concept of Fedora 14. First, the codename for Fedora 14 is ‘Laughlin’. This is after Robert Laughlin, the 1998 Nobel Prize winner in physics for the fractional quantum Hall effect research he did. Laughlin argues for a concept called ’emergence’ which states: “The whole is more than the sum of its parts.” Kyle’s proposal shows many separate lines coming together that, when you step back, forms a solid shape as well, relating to Laughlin’s concept of emergence. Secondly, Fedora is a kind of a single object – a Linux-based operating system aggregating many individual open source projects and work. A whole of many parts. Fedora is also a community made up of many individuals from all over the world working together in an open manner. So the concept also relates to what Fedora itself is and is all about! Now that we’ve made our decision, the Fedora design team needs your help in making Fedora 14’s artwork awesome! Our deadline for turning this conceptual art into a polished alpha wallpaper is July 27th. Help us get there by giving us your feedback on the F14 artwork feedback wiki page, the Fedora Design Team mailing list, or even the comments section of this blog post. Later on, for Fedora 14 beta, we’ll be creating splashes and other artwork for this theme, but right now we’re focusing on our first task, the alpha wallpaper. Supplemental wallpapers are wallpapers that are made available to Fedora users but are not turned on by default. Do you take a fancy to one of the other Fedora 14 default wallpaper concept submissions? Suggest it as a supplemental wallpaper! Take an amazing abstract photo you think would make a great Fedora 14 background? Submit it! See an awesome Fedora-friendly licensed piece of digital art and want it considered? Suggest it! We need your design talent! Are you an awesome artist looking to get involved in free & open source software, or even an old hand at FLOSS? All the sources for our wallpaper concept are available – what are you waiting for? The core of the image is a model Kyle built using Blender, the incredible open-source 3D tool. Crack it open and try your hand at iterating the design! 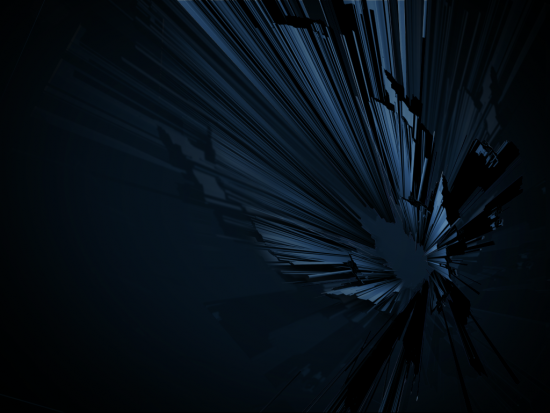 Remember kids, we’re working towards having a heart-stoppingly amazing wallpaper ready by July 27th so it can ship in Fedora 14 alpha. 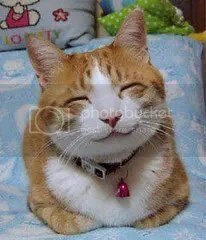 (We need to succeed, or else happy cat will start frowning! You wouldn’t want to see that, would you?!?) In Fedora, we pride ourselves on practicing what we preach and creating our designs and artwork just as openly as the software in our distribution, as an open community effort! Come join us and be a part of the fun! By the way, we had a lot of awesome proposals on the table for Fedora 14, including a proposal by our very first design bounty ninja Jef van Schendel. Let us know which ones you would like as supplemental wallpapers for F14! Robert Laughlin photo credit: Linda A. Cicero / Stanford News Service from Wikimedia Commons, used under a Creative Commons Attribution 3.0 Unported license. Need your help image credits: Pointing hand from johnny_automatic on openclipart.org, public domain. Font is HVD Comic Serif Pro by Hannes von Döhren, CC-Attribution 3.0 license. Happy cat image credits: Yuri Kimura on Flickr, used under a Creative Commons Attribution-ShareAlike 2.0 license. oh nice! so theme is now = walllpaper? great! I just updated the OP to hopefully be more clear on this point. Let me know if it’s still confusing. Looks already great. I hope you can get some input from Jakub for the polishment. That finally looks like a background I would use. I think I have not used the default Fedora background or theme in the last five years. How come? What kind of backgrounds do you usually prefer? Re Kyles design? Yes, looks good. How to make it a little brighter? Bit too sombre at the moment? Love the new theme for F14. Looking forward to seeing this in a few months. Just my 2 cents, I think the wallpaper looks a bit intimidating. It’s pretty dark and has a kind of “agressive” depth. When I look at it, it’s not really a picture I’d like to see on my desktop every day; it’s rather something I’d expect to see in a bad dream. IMO this is too dark; was the reason why I didn’t like the F13 wallpaper but it seems like this trend continues …. I don’t like the cross lines on some of the rays. Overall it is pretty dark and a bit out of focus. Otherwise I think the concept is good. The concept behind the wallpaper/theme is great but the wallpaper blows. Its too dark and not easy on the eyes. Agree with Shane, it’s quite dark. Make it little bright. I like the concept of trying to show “the whole is more than the parts”. However I agree with others that its too dark. I tried a lighter version but then it looked like a fracture pattern in the screen – not nice. Perhaps a bit of curvature in the lines might help. Mr. Julian Aloofi in his post, said exactly my thoughts. I liked Mandrivia’s wallpaper with bluish screen and a flower in middle right. Cool wallpaper! It looks almost exactly like the Combine Citadel in Half-Life 2! I love it! I think it is a little to dark for my taste. But on the other hand, I don’t use abstract art as wallpaper, I’ll use my own photos and such. But I guess it will do as background for the login-screen. But as I said, a little brighter. Yep, That’s because this blog post was posted 2 weeks ago, on July 13. Kyle’s post was made today, based on a draft he made yesterday. This blog post has a much older draft.